While the "Grow Your Blog" party was underway, 52 Quilts published post #600. I didn't want to compete with the GYB giveaway, so I waited until this week to kick off the celebration. Oddly enough, I don't seem to have observed the milestones of 100, 200, or 300, or 500 posts. Only 400 and 500! The very first post was published on November 21, 2011. I remember being so excited when we reached 50 followers. Now, 52 Quilts has more than 700 followers on Bloglovin' and the same via Google. I have no way to verify how many follow by email -- but that's a lot of readers, huh? I appreciate you, each and every one. And to say "thank you" I think there should be a giveaway, don't you? How about this? 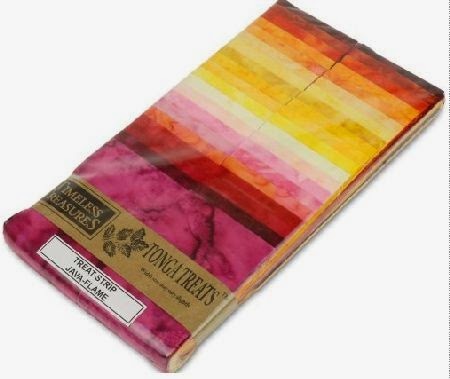 It's a Timeless Treasures "Tonga Treats" package of 40 strips in the colorway "Java Flame." Plus some additional goodies that will be a surprise. Comment on this blog post. Tell me how you would use this Tonga Treats pack. If you're a no-reply blogger, please include contact info. If I can't find you, I can't send you the prize. My blog is set not to allow anonymous comments so that the robots cannot find me. If you do not have an ID, you can still enter by email at the address listed under "About Aunt Marti" in the right-hand column of this page and I will post your comment for you so you have a chance to win. International entries welcome, of course! Giveaway ends Saturday, February 21 at midnight Mountain Standard Time. The winner will be announced on Sunday, February 22. 600 posts! It's been a fun ride -- thank you for coming along! I would make an awesome quilt! Joan, I'm so sorry your comment comes through as "no-reply commenter,"so I can't answer via email. And if you win the giveaway, I can't find you! Please email me your email address so if you win, I'll be able to notify you. I would make a small quilt to bring the tropics into our home during this snowy time of year. I follow you through my Feedly reader. Conratulations! Thanks for the informative blog. Now; what to do with those wonderful colors....I think I would sort them into light and darks and make another wonderful log cabin! I would make as many blocks as I could and just cross my fingers and hope for a wonderful way to make those bright and cheery log cabins speak to me! 600 posts, congratulations! Hmm what to make with those colours? They sort of remind me of a sunset. Maybe something pictorial even? I haven't made a pictorial quilt yet but its one of those one day quilts! I would make a lap quilt for a relative who would so appreciate one. I am a beginner and just learning-so it would be a simple pattern. Andrea, I'm so sorry your comment comes through as "no-reply commenter,"so I can't answer via email. And if you win the giveaway, I can't find you! Please email me your email address so if you win, I'll be able to notify you. To be honest, I don't know how I would use these lovely fabrics, but I surely would have fun trying to figure it out ! Those are just beautiful fabrics and colors. I think I would use them in a special quilt for my granddaughter. Tressa, I'm so sorry your comment comes through as "no-reply commenter,"so I can't answer via email. And if you win the giveaway, I can't find you! Please email me your email address so if you win, I'll be able to notify you. Congratulations on your dynamic blog posts! (I am so far behind on my entries.) I hope to make placemat sets for Christmas gifts this year and this pack of coordinating fabrics could help me decide on which pattern to use. I think they would make a beautiful table runner. I'd use it in a challenge for my Art Quilt Group. Our monthly challenges leave a lot to our creativity. Congrats on 600 posts! I've been saving batik & marble scraps for a postage stamp quilt, so I'd use these in that. Thanks for the lovely giveaway. Congrats!!! I love these colours and I think it would be perfect for a quilt... But I'd have to think about the pattern to decide on a perfect design!! Thanks!! I can see a sunrise in the making! I think those colors would look fabulous in a chain looking quilt. I am making, as we speak, 9 patch blocks for three different quilts. One uses a lot of yellow, orange and pink. The fabric in this generous giveaway would play so nicely with the others. Thanks for the chance. We are making string quilts as prayer donation quilts for a local church and these would make beautiful blocks. Thanks for a chance. Love your blog. Gosh, I don't know what I'd do with it! Quilts for Kids? A quilt to keep? Who knows, but with those fantastic colors I know it will end up fabulous. I know what you mean about excited. I am because I now have 40 followers because of GYB! I would use this pack to make blocks that are needed for a spring jacket I will be starting soon. It reminds me of a sunset. Maybe a nice wall hanging. Thanks for the chance and congrats! I think that I would like to make a quilted bag large enough for my laptop. TY for the chance! Congrats on reaching 600! I enjoy reading your blog but I LOVE looking at all the quilt pictures; the monthly UFO round-up is a big favorite. If I won, I'd make a quilt top for one of the grand-girls. All of them love those colors! Good job! I would make a quillow with this bundle the coloring is gorgeous. Thank you for the giveaway. It certainly has been a fun ride! I love visiting your inspiring blog, and I follow on Bloglovin. And congratulations on 600 posts! I would use this awesome fabric in a sunset landscape quilt. Thanks so much for this generous giveaway! Thanks for a great blog. I love the Tonga Treats fabric and would use any of them in a bargello quilt. Congrats on 600 posts!! The Tonga Treat looks yummy, I would use it for a strip-pieced sunset.... There is a way to see how many are following you by email. When you are signed in to your blog, click on the little crossed screwdriver and wrench thingie by your "Follow by Email". Then when the new window opens, click on "View Stats and Learn More". That will show you how many are following by email. Congratulations on 600 posts and for such a nice giveaway prize. I know I'm supposed to say what I'd use the Tonga Treats for, but I'm a tactile/visual quilter....I have to see and touch fabric before I can make decisions, but I'd probably use it for applique. If I'm lucky enough to win, I'd make a quilt for a friend; she'd love those colors. Congrats on 600 posts. Thanks. I'd use this fabric to build up my collection of fabric for unknown future projects!! Although I may use the red tones for my Mickey and Minnie valentine quilt! Congratulations on 600 posts. If I won the giveaway I'd make a table runner for a friend's birthday in April. I spy just the right shades of dark pink in there that I've been looking for to match her sitting room. Congrats on your 600 posts. And thanks for the chance to win that give away. I would make a table runner for myself. I always sew for others and give it as gifts so I don't have much in my home made by me. This would be a sweet indulgence to make something for myself and our new home. Such beautiful colors! I think these steps would make a wonderful summer bag. Congrats on 600 posts! My first thought was of a colourful bag. Congratulations on your 600th post and 700 followers. That is impressive. Congratulations on your 600th post. I so enjoy your posts and emails! Thanks for all the information you have shared with us over the years. I would love to win this, the colors match a few packs of charm squares I have waiting to get more fabric to make a small quilt. Thanks and I look forward to 600+post in the coming years. Congratulatins! I wish I had seen all 600 as I always enjoy your posts. Th colors of the fabric in the. Giveaway are so cheery. I think I'd use it to make a runner for the bottom of my bed. Then I'd have to make a new quilt, too. Lots of fun! Aunt TC, I'm so sorry your comment comes through as "no-reply commenter,"so I can't answer via email. And if you win the giveaway, I can't find you! Please email me your email address so if you win, I'll be able to notify you. Congratulations on your 600th post! To be honest, I would have to see the lovely Giveaway and let it 'tell me' what needs to be made with it...the colours certainly look lovely. Congratulations!!! I think that I will sew a rainbow quilt. Thanks for a lovely giveaway. 600 posts is a great achievement! I would give it to a friend and see what she creates! I think I would sew a curved table runner. Congratulations! This would make such a fun, cheerful quilt! Arianna, I'm so sorry your comment comes through as "no-reply commenter,"so I can't answer via email. And if you win the giveaway, I can't find you! Please email me your email address so if you win, I'll be able to notify you. Thankyou Marti, that is a wonderful giveaway, those colours made my mouth water! I have a pattern for a rainbow batik quilt. I think these fabrics would be gorgeous. WOW, Aunt Marti! Your blog is HOT! Congrats! The Tonga Treats is so colorful, so many ideas to use it! I'm thinking a herringbone style table runner to brighten up our dining table. Good luck to everyone! Oh wow, those batiks are gorgeous! Recently I've been helping a friend find patterns using jelly roll strips and found several I want to make myself so these would be perfect! They would make a beautiful lap quilt. Thanks for the chance to win! I would make my 96 year old mother a shawl. It's like a runner with pockets on the ends for her hands, remote, Kleenex, etc. She would love the colors. Congrats on 600. Love your blog. What a nice idea! I'm so sorry your comment comes through as "no-reply commenter,"so I can't answer via email. And if you win the giveaway, I can't find you! Please email me your email address so if you win, I'll be able to notify you. I am working on a scrappy trips and these would be perfect! I am always here reading, even when not commenting- grad school is a killer. I know you understand!!! I love the colors- maybe a french braid style wall hanging or quilt top? Hy Marti... The colors look like precious... probably would make a degradet barguello. Love this! I would work these into a quilt. Thanks for a chance to win. Congratulations! I think I would make some pillows for my couch. Have a wonderful day! Yay, what a great giveaway, thank you! I'm a follower thanks to the blog hop and I'm so glad I found it. :) I think I'd use the strips to finally make the knitting needles case I've been procrastinating on! I would make my first strip (jelly roll race) quilt. I've never used batiks or dyed fabrics like these so it would be fun and outside of my fabric palette. I love jelly roll race quilts! I'm so sorry your comment comes through as "no-reply commenter,"so I can't answer via email. And if you win the giveaway, I can't find you! Please email me your email address so if you win, I'll be able to notify you. I'm planning on doing a batik quilt soon, and these colors fit right in. Congratulations! If I win, I will make an Irish chain quilt. Thank you! These would make a gorgeous Irish Chain! I'm so sorry your comment comes through as "no-reply commenter,"so I can't answer via email. And if you win the giveaway, I can't find you! Please email me your email address so if you win, I'll be able to notify you. This package of batiks would make a fabulous table runner or table topper for my winter home in Arizona. Love the colours! I use batiks mostly for raw edge applique, so I would use them for that purpose. Thanks for the chance, Marti. Your email subscription is via feedburner. If you go to their site while being logged into your blog, it will bring up a list of your subscribers via the publicize tab. Congrats on your 600th post. I would make some mini houses for my paper pieced house quilt. I am seriously lacking in Batiks, and these are beautiful. I would have to make a small quilt for my 4 year old grand daughter. She has recently decided that she needs quilts on her wall. She attempted to steal the one I had made her mom. She got her first wall quilt for Valentines day and we let her choice where it went on the wall. But she is back eyeing her mom's wall hanging again. She says she needs more. Congrats on #600 post. Enjoy reading your posts. If i should win, I have a new bag pattern using strips, and these would make a lovely summer bag. Congrats! I just love tonga treats! I've been dying to make a table runner like a Jinny Beyer pattern I saw. But I haven't found the right batiks to do it with so this would be awesome. Thanks for sharing! Congrats on #600, and hope to see 600 more! I'm not sure what I'd incorporate this into, but they are lovely. The obvious is a quilt, but I would have to peruse my endless supply of books, mags, the internet, to find just the right project. CONGRATS ON YOUR BLOG! LOVE IT! THANKS FOR SHARING A PRETTY GIVEAWAY, WHICH I'D MAKE INTO A NEW QUILT FOR SURE! I love tonga treats and enjoy your blog. I get lots of ideas from you. Thank you foe a chance to win. Thanks, Nancy! I'm so sorry your comment comes through as "no-reply commenter,"so I can't answer via email. And if you win the giveaway, I can't find you! Please email me your email address so if you win, I'll be able to notify you. Many congratulations!! I'm doing the The New Hexagon Millefiori BOM so I would definitely be able to squeeze these magical fabrics in to the kaleidoscopic patterns - PLEASE!! I would love to use the Tonga Treats to make a bag for my daughter. She would love the colors. Lovely colors--maybe a wall hanging for me! Congrats on 600! Good plan, Susan! I'm so sorry your comment comes through as "no-reply commenter,"so I can't answer via email. And if you win the giveaway, I can't find you! Please email me your email address so if you win, I'll be able to notify you. Reminds me of summer sunsets, so maybe a nice summer weight quilt. Thanks for the opportunity to win! And congrats to you! This fabric would make a beautiful sunset strip quilt. I think those strips would make a beautiful tote bag. I am one of your followers by email so I am sure you are way pass the 700 mark. A tote bag is a great idea! I'm so sorry your comment comes through as "no-reply commenter,"so I can't answer via email. And if you win the giveaway, I can't find you! Please email me your email address so if you win, I'll be able to notify you. I would add those luscious colors to another bali pop to make an awesome hawaiian strip pieced applique. YUUUUMMMMM! Excellent idea! I'm so sorry your comment comes through as "no-reply commenter,"so I can't answer via email. And if you win the giveaway, I can't find you! Please email me your email address so if you win, I'll be able to notify you. Congratulations on your 600 post milestone. After playing a series of what - if arranging games, I'd build a charm & jelly quilt like the one pictured on your 11/21/11 post. It's perfect for these batiks. I love that quilt, Susan. It was the last one I made for my Mother. I'm so sorry your comment comes through as "no-reply commenter,"so I can't answer via email. And if you win the giveaway, I can't find you! Please email me your email address so if you win, I'll be able to notify you. They would make a gorgeous baby quilt! Congratulations on the success of your blog....it's a great one! I would love to use those Tonga strips in an Edyta Sitar pattern! What a beautiful table-runner this would make, that's what I would work on! I would make a wonderful spring table runner. Congratulations! I would probably make some coordinating throw pillows for my living room. The colors are fabulous! Grats on 600 posts! I've enjoyed so many of them. Those fabrics are lovely and would make a great lone star quilt. Congratulations on reaching 600 posts! Quite amazing. I love the bright, happy colors of this Tonga Treats bundle and I would make a zippered tote to use to carry my sewing machine to classes. Congrats!!!! I love Tonga Treats - I have a miniquilt that would work well with them!!! wow 600 posts. I started blogging in Feb 2011 and have a sad 176. LOL but then I don't post every day and sometimes week. Way to Go! I would make myself new pillows to brighten up my living room! Okay this is weird. I commented and it didn't publish. I am trying again. Congratulations on 600 posts and years of blogging. I have a blog anniversary in March and it will be my 7th year and I have over 732 posts, but not as many followers as you have. I am grateful to have anyone want to follow my blog. I would make my daughter a new handbag with the batiks as she and I love batiks. The last bag I made her is getting thread bare and she really needs a new bag. Thanks for having a giveaway and hope you have many more years of blogging ahead. I'd make a picnic quilt ready for the warmer weather!! I would love to make a granny square lap quilt with this fabric! Congratulations on your posts, it's a huge milestone! Thanks so much! I'm working on a paper pieced wall hanging and the fabric colours would be a great addition. Congratulations on your posts. Thanks for the chance. Congratulations! I am one of the lucky 700+ on Bloglovin. I would mix this with white for contrast and make some patchwork totes. Congrats on 600! I would make a few small totes for my little granddaughters. These are great colors. Thanks for the chance to win! I am a new quilter and would love to try out one of the patterns from your blog - there is so much inspiration. Lots of good jelly roll quilts here! I would probably make a small lap quilt. Thanks for the chance to win. Wonderful ... I love to see a small business being successful! I would make a quilt of course... love those colors! Happy blogaversary! That is a great milestone. I would make some pillows for the sofa with it. 40 strips of Tonga Treats says a strip quilt would be in the making here! What a hot quilt that would be! Gorgeous colors! Congrats on 600 posts. I love batiks and use them for lots of backgrounds. Thanks. Congrats!! I think I would use it as the arcs of a Bali Wedding Star by Judy Neimeyer. I think it would a nice changeup, with maybe blues as the backgrounds. A great quilt for my niece! She loves these colors. Congratulations! Imagine 600 blocks, that could be a very large quilt. I would use the Tonga for a quilt. I love these strips. The colours in this pack are gorgeous! I would use them in some artwork with lots of embroidery. Congratulations on 600 posts. I don't generally like these warm colors in my clothing, but love them in a quilt--they really wake up the quilt. I have a stained glass effect star quilt that I'm saving up fabric for and these colors would work magnificently! This pack would be really good for the binding tool star I recently saw from Missouri star quilts! I add it to my some day list and with this pack it could bump up :-) Thanks and congrats! Congrats on 600 posts! I have never actually used Tonga Treats before. However, many of these colors go with the fabric I just purchased for my daughter's new "big girl" bed quilt. I would love to incorporate them in. Thanks for the chance. Those tonga treats would be perfect for a Bargello quilt! I would let them inspire me into a project! I would make a fantastic tote bag! Congratulations on 600 posts. It's no wonder that I keep coming back to your pages here, you are full of inspiration. I have a fantastic idea of how I would use this gorgeous fabric pack. A Cathedral Window wall hanging for my lounge wall. I'd want everyone to see the jewel-like colors, so I wouldn't hide it away in a bedroom. 600 posts is amazing, congrats! I'd make a quilt if I won. Thanks for the giveaway! I think I would make a colorful tote. I love the colors! Other than "I'd make a quilt" I don't really know. I would make tote bag. All the colors, except for the pink, are in my favorite color combo. I'd probably keep it together and make something miniature. I'm coming along with my temperature scarf and it makes me think about you all the time, Marti! Congrats!! I would make a tote and cosmetic bag. Thank you for the giveway. That's a lot of Blogging - well done! Those colours cry out to be made into a crazy patchwork quilt with lots of embellishments. It would be hard to choose, but work hard at it. Love your blog and love these fabrics... I would make a lap quilt from one of my Kim Brackett books. Wow, thanks for the give away! I would probably make a basketweave quilt. I've been wanting to make one For-Ev-Er! Congrats on the 600 anniversary! I would like to make a rainbow quilt with these fabrics. I enjoy watching the things you make! I would use the fabrics with the batik we were given in our Seems Like Sisters Bee for our December 2015 challenge. Oh - these fabrics would fit PERFECTLY! Those strips say "bargello quilt" to me! I got a new book of bargello quilt patterns that I've been dying to try! I think I would make some log cabin blocks for cushions! Love the bright happy colors! I would make a jelly roll quilt for a baby girl that is coming (not related) in May! I would make a beautiful table runner with those Tonga Treats! Congratulations on your "milestone" too. I would make a surmise quilt -- those are beautiful! I've never had a Tonga Treats package-it would be a treat to win :). I'd love to combine the Treats with a batik print and make a luscious lap quilt for my daughter who loves bright colors. Thanks! I think I would maybe do a pinwheel quilt or star quilt. Congrats on your accomplishment. It would make such a beautiful and colourful quilt. What gorgeous colors! I haven't ever bought any Tonga sets, so it would be a tough choice, but I'm thinking either a log cabin or using them in a quilt with stars. This would make a beautiful braid quilt! Congrats on your milestone. Those fabrics are gorgeous and would be just perfect to use in a curvy quilt I saw on ManSewing on YouTube recently. Grow Your Blog: We have a Winner!